Pets are one of the greatest joys in life. There’s nothing better than an excitable dog or indifferent cat to welcome you home after a long day. 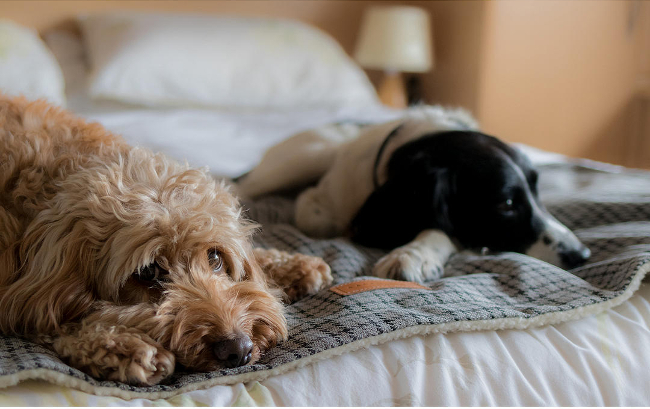 The only real downsides are the cost of pet-ownership and the sheer amount of stuff pets tend to accumulate; beds, toys, food bowls, toys, blankets, toys… you get the picture. Unfortunately much of this stuff is badly designed; both aesthetically and functionally. Pet supplies are often made of plastic or cheap fleece and tend to fall apart at the slightest hint of misuse. When you’ve spent time and money creating a beautiful home, tatty pet toys sprawled everywhere ruins the effect somewhat. 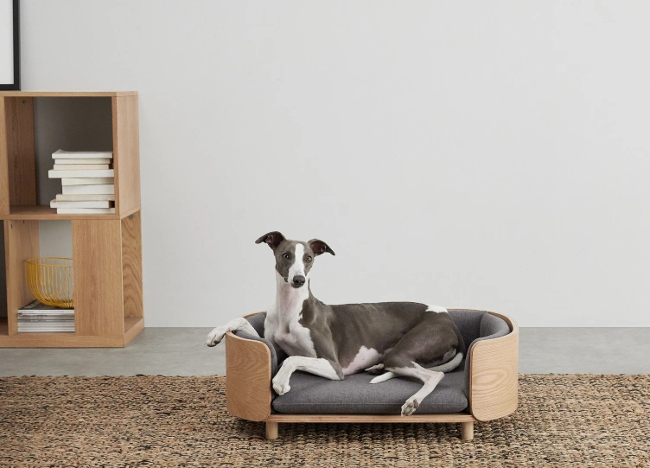 MADE have created a cosy, comfortable sleeping nook for your favourite canine. The sleek design will impress anyone, while the washable covers and sturdy plywood frame gives this bed much-needed durability. For more stylish dog beds, check out OKA’s website – they have a great range! Another fantastic design from MADE. 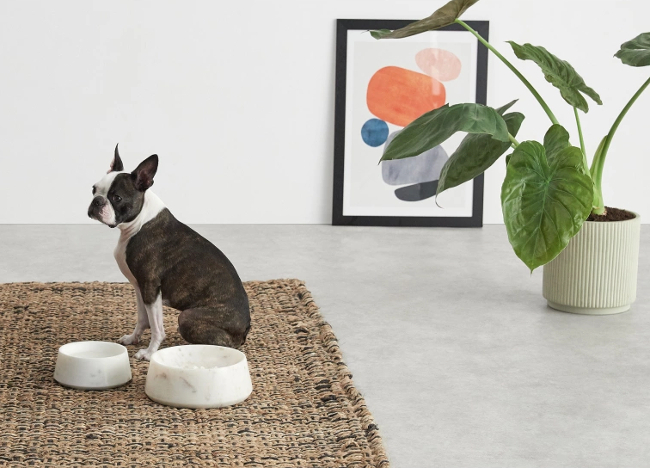 These marble pet bowls don’t just look great (and go perfectly with your marble kitchen worktops) but they work hard too. The weight of the marble makes the bowl difficult to overturn and, most impressively, it keeps food and water cool – even on warm days! 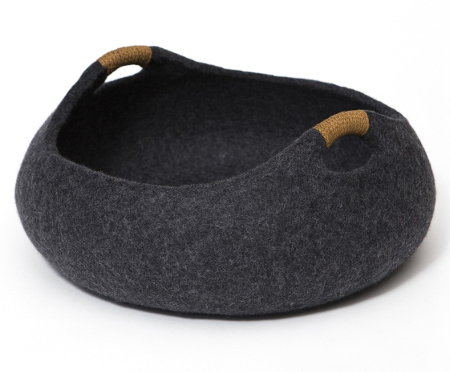 Mungo & Maud have created this cave-like bed for your elusive feline friend. We all know how much cats love hiding in boxes, and this is a much cosier (and better looking) alternative. Made from heavy duty dark grey felt it’s practically indestructible too. Blankets are a must-have for pets that insist on sleeping on sofas and beds. They’re also useful for keeping muddy paws off car upholstery. This soft blanket has a modern check design in goes-with-everything grey on one side, is reversible (with cream fleece on the other side), and can be machine washed. Win, win, win! Good looking pet toys have been quite hard to come by, and honestly? It doesn’t really matter how they look, as long as your pet loves them. Keeping pets thoroughly entertained with plenty of different toys prevents boredom and subsequent bad behaviour. 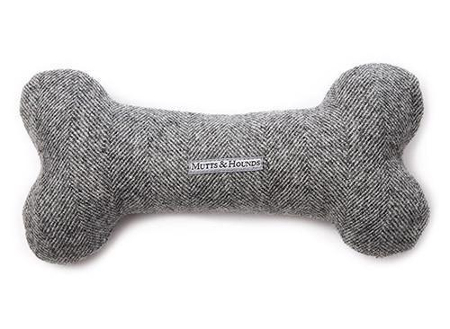 That said I do like the design of this squeaky bone toy by The Stylish Dog Company. Grey tweed is always a classic. And finally, an ultra stylish food bowl for your cat. 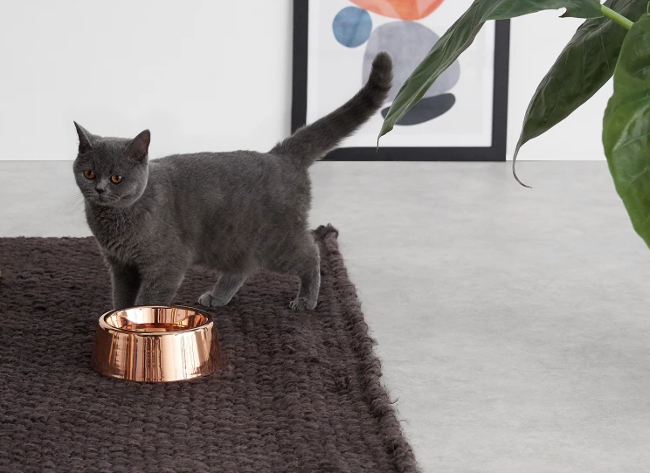 Again, made by MADE (I’d recommend checking out their entire pet collection – it’s great) to be durable, practical (it’s non-slip) and stylish. That’s all for my round-up of stylish pet supplies. Got any you’d like to add? Make your suggestions in the comments below.